The first Champions League semi-final of this season sees city rivals Real Madrid and Atletico Madrid pitted against each other. 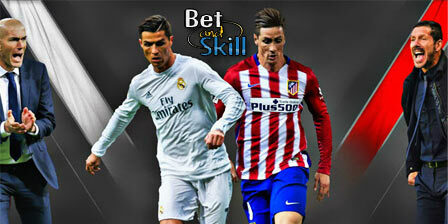 Who will win the 1st leg match at the Santiago Bernabeu? 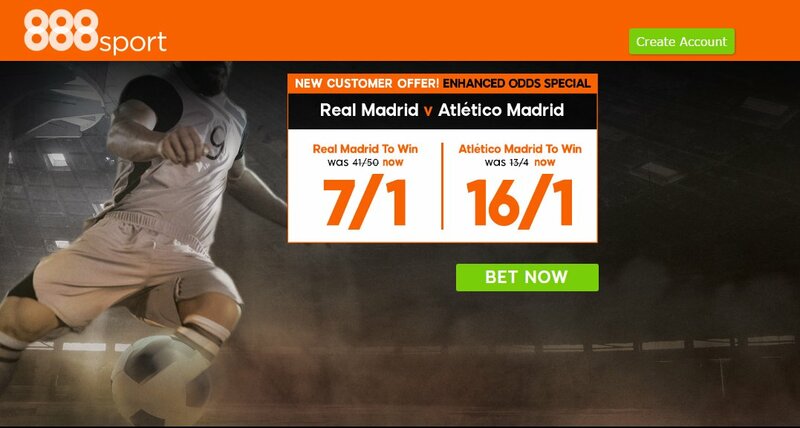 Check out below our Real Madrid v Atletico Madrid betting preview with predictions, betting tips, probable lineups, team news, enhanced odds, bookie offers and no deposit free bets on the Champions League semifinals. Real Madrid’s quarter final clash with Bayern Muncich was settled in extra time. Real had won the first leg 2-1 at the Allianz Arena but the Bavarians were 2-1 up at the end of 90 minutes at the Bernabeu before the Spanish giants put the hammer down with three unanswered goals in extra time. Domestically, Zidane's men recovered from the El Clasico defeat with a 6-2 win at Deportivo. The Galacticos are level on points with Barcelona, but they have one game in hand. Real Madrid and Atletico Madrid have contested two of the last three Champions League Finals, with Real running out winners both times. The Blancos have lost only one of their last seven Madrid derby showdowns with Atletico, beating them 3-0 back in November before drawing 1-1 with them a few weeks ago. Zinedine Zidane must do without Gareth Bale, who remains sidelined after aggravating an old injury in El Clásico. Isco is expected to take his place in the front free, alongside Cristiano Ronaldo and Karim Benzema. James Rodriguez and Alvaro Morata are also options. Raphael Varane returned to action against Deportivo La Coruña last week but might not dislodge Nacho at centre-back. No changes are expected in midfield, as Toni Kroos, Casemiro and Luka Modric will retain their starting berth. Atletico have won 9 of their last 15 games in all competitions, losing only twice. 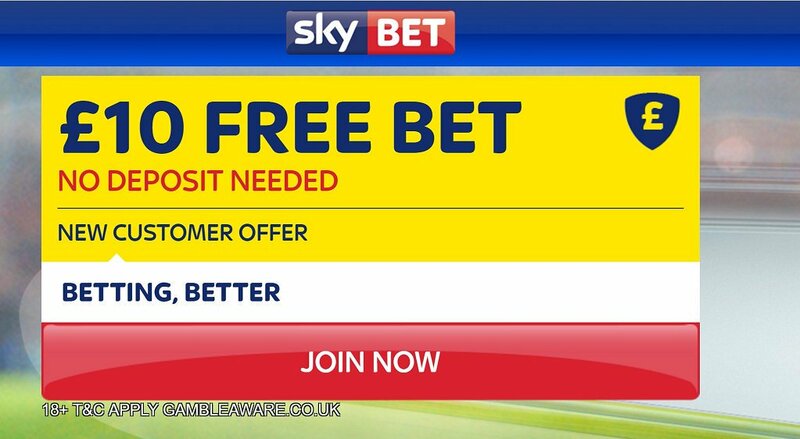 They go into this match on the back of a 5-0 thrashing of Las Palmas at the weekend and have not lost on the road since the start of 2017. Diego Simeone's men currently sit 3rd in La Liga, well behind Real and Barça and only three points above Sevilla. As to the Champions League, Atletico have ended Leicester City’s fairytale run in the quarter finals but they had to work pretty hard for a 2-1 aggregate win. The Rojiblancos have kept 10 clean sheets in the last 14 matches in all competitions. Yannick Ferreira-Carrasco is a major doubt after picking up a shoulder injury against Villarreal last week, which could see Nicolás Gaitán retain his place in the team. José María Giménez limped out the Las Palmas game with a muscle problem and could join other right back defenders Juanfran and Sime Vrsaljko on the sidelines. Kevin Gameiro scored two goals at the weekend and that may have earned him a starting spot ahead of Fernando Torres. The likes of Saul Niguez and Gabi are expected to play in the middle of the park. 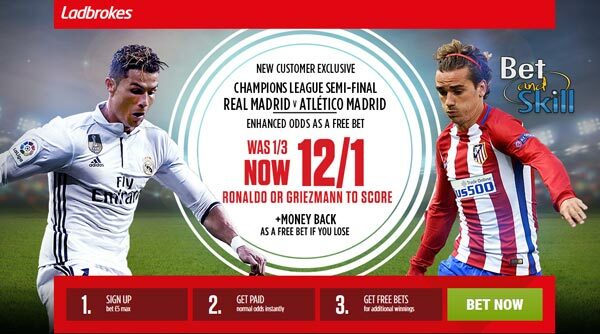 "Real Madrid v Atletico Madrid predictions, betting tips, lineups and odds (Champions League semifinal - 2.5.2017)"